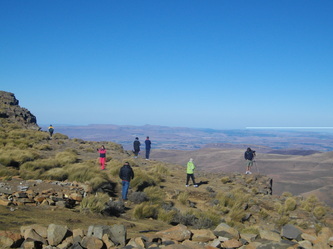 Lesotho was on my route simply because it is a visa free country and people said there were mountains. I had even considered skipping it due to rumors of snow and negative temperatures, which after over a year in tropical Africa I was not enthused or prepared to experience. Needless to say, I am glad I went. 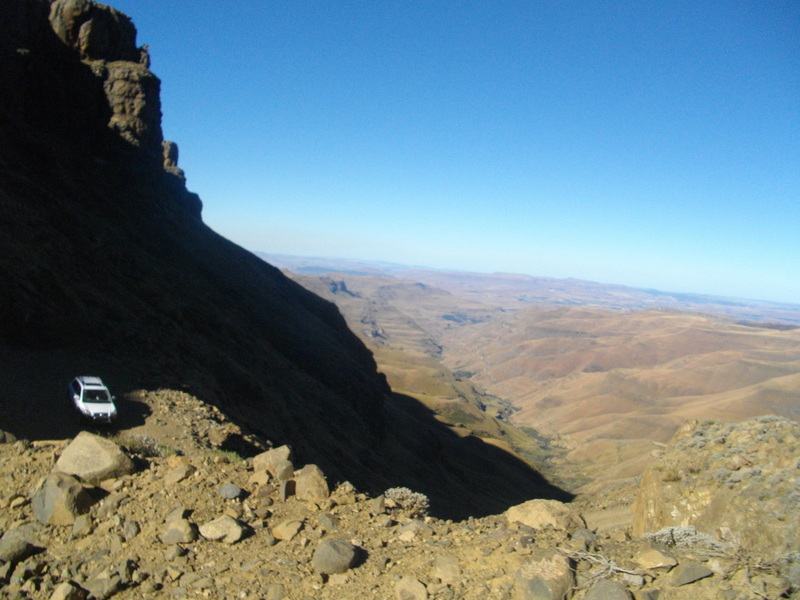 From the moment we left the South Africa border post and started winding our way upwards on the steep switchbacks that traverse no man’s land, it was clear that Lesotho would be the most culturally and geographically unique country that I have visited in Africa. you are driving from Durban on the Indian Ocean with wintertime lows in the 20s, and in a few hours are at the top of 3000m mountains with wintertime highs in the single-digits, the shock to your system is a little more drastic. As for me, I was trying to remember my Canadian pride and not complain too much; but it was bloody cold. The family dropped me off at the top and seeing as it was only mid afternoon I decided to start hiking up the rough gravel road. 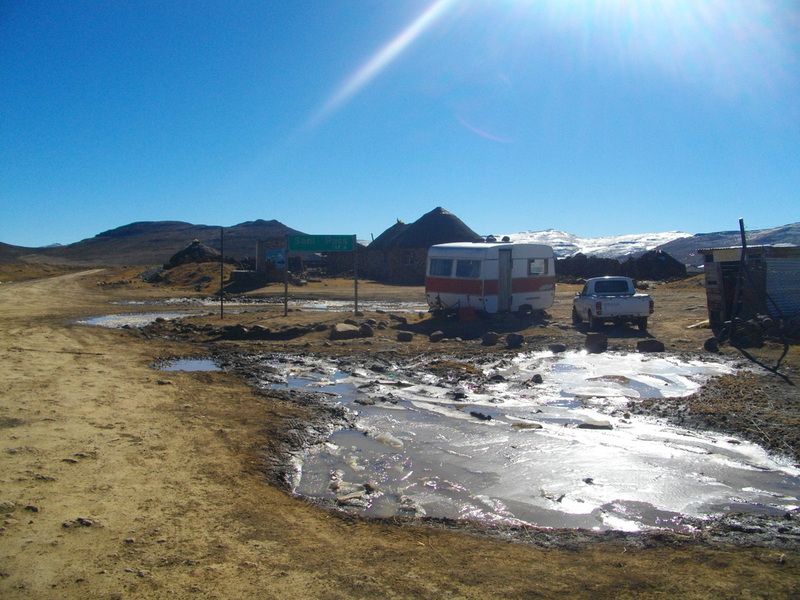 The idea was to hitchhike deeper into the mountains and camp at a village or in the wild, but the more I walked the more it became clear that my chances of getting a lift that day were non-existent, since there were no vehicles going further than the pub. As the road climbed higher, nearing 3000m, the snow got deeper, the shadows lengthened, and mentally I began to question whether the rating on my -10C sleeping bag would hold. In the end, two guys with a pickup stocked full of beer who had come all the way from Durban with the goal of “driving in the snow” pulled up, and after toasting a few I was warm and amused in the back seat as they attempted to drive up the steep, snowy slopes that closely guard the road. 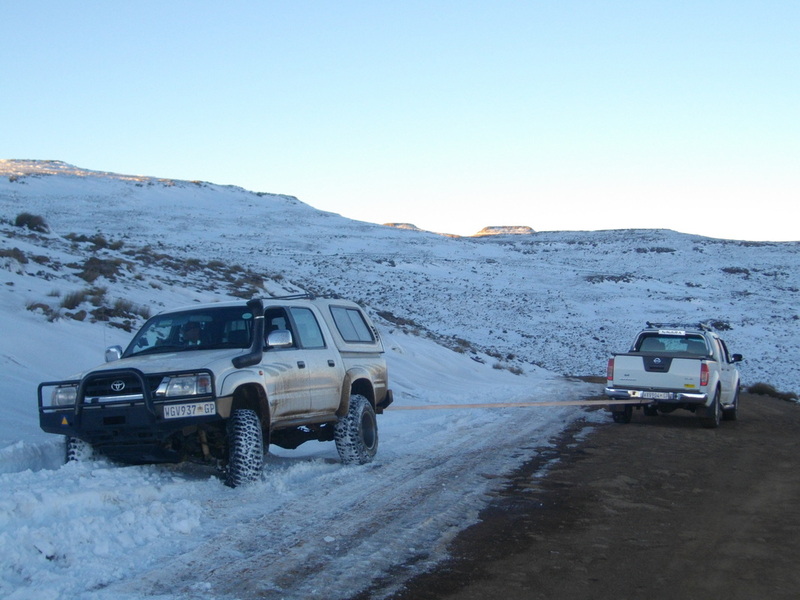 They promptly got stuck, and after sitting in the warmth with my beer and watching them attempt shoveling out (had to let them get the full snow-experience) I accepted a ride back down to the Sani Pass Pub, where I talked my way into discounted accommodation on a comfortable pile of mattresses in the laundry room. 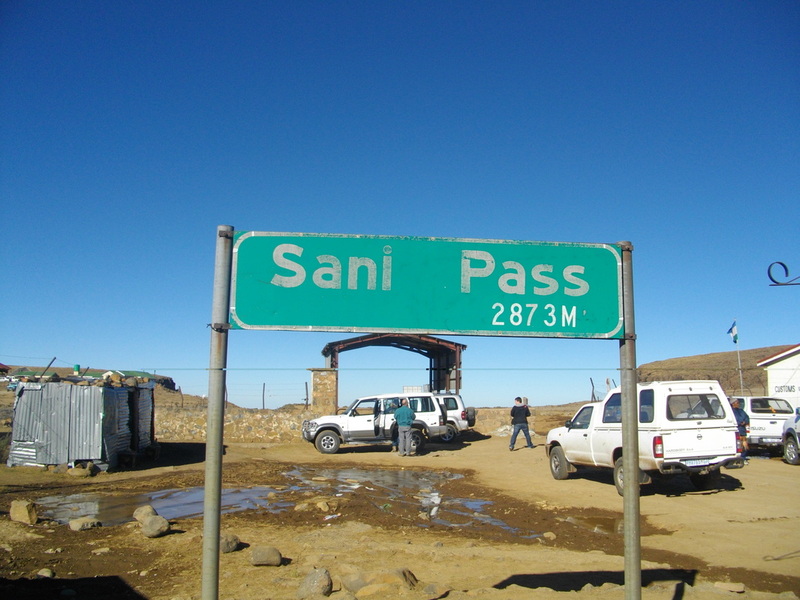 So far, in the Sani area, I hadn’t seen too many of the much-talked-about Basotho villagers. They have a unique history among Africans, being that the entire country was founded by one person – King Moshoeshoe I. 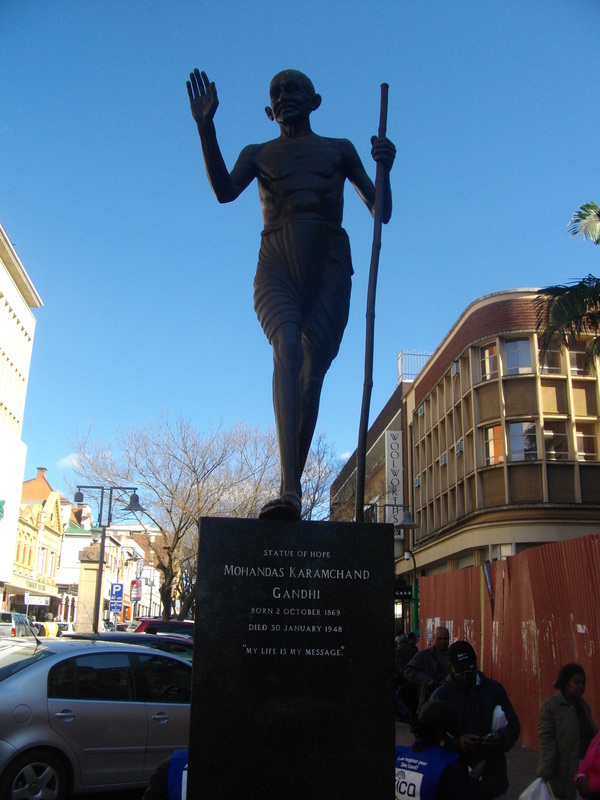 He had led the Basotho people in defending themselves against the many power-hungry threats of the nineteenth century – mainly the Zulu and their famous chief, Shaka, the British, and the Boers. 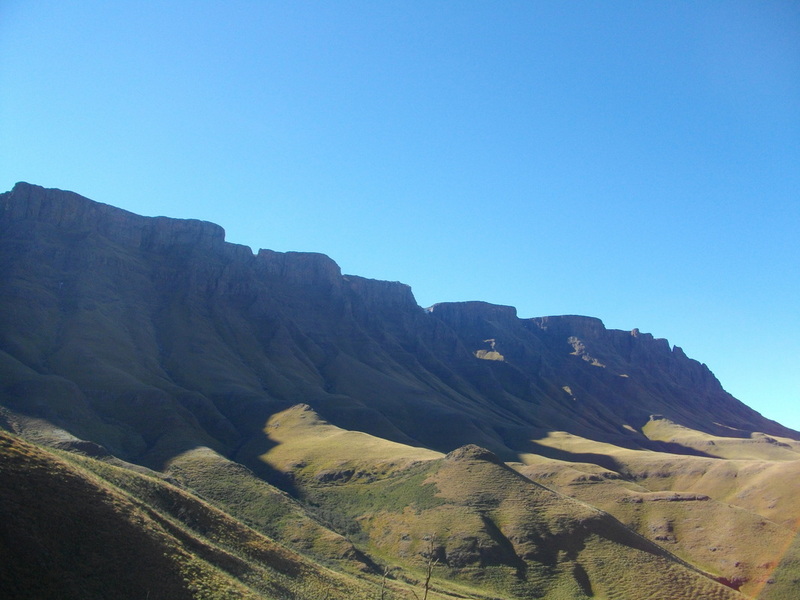 By taking to the mountains and using the inhospitable landscape and defendable mountain passes as his base, he was able to fend off wave after wave of invasion and eventually received status as a British protectorate, which saved his people from further Boer invasion. The present day Lesotho is unique in that, aside from immigrants, it is a mono-cultural country, with Sotho as the sole official African language, and many traditions uniform across the kingdom. This contrasts countries like Nigeria and DRC, where there are hundreds of ethnic groups and spoken languages, or even Gambia, which is smaller in size but has four main ethnic groups with distinct culture and language, each with several dialects. To my uninitiated foreigner’s eyes, the result is a country with none the tribal conflict of many African states, where the people are happy with their King to the point that he feels safe enough attending the public gym and driving around with minimal security. The family I stayed with in the capital, Maseru, has had the King’s daughter over for a birthday party. I had to laugh when thinking back to the behavior of government officials in other African countries, such as Cameroon, where if Paul Biya is driving through Yaoundé the entire city is shut down for an hour before his 40-vehicle caravan passes through. It is unfortunate that despite the ethnic unity in Lesotho, it is nevertheless a dangerous country and residents have many violent horror stories to tell. In the mountains I was warned to keep my distance from herders as they have a history of sexual-assault and robbery. Walking past a small mountain village, a young teenage girl ran out from an icy riverbank where she was doing her washing to tell me not to walk alone because “the shepherd boys will slaughter you.” In Maseru there were stories of Peace Corps volunteers getting raped and murdered, strings of armed robberies of expat homes, and assaults in broad daylight along busy streets. 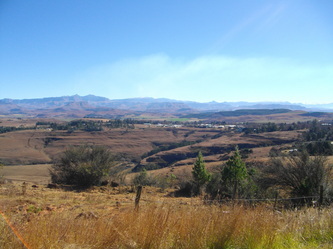 I was and still am shocked that such a small, tranquil mountain country could possibly have so much violence. And a plausible explanation? 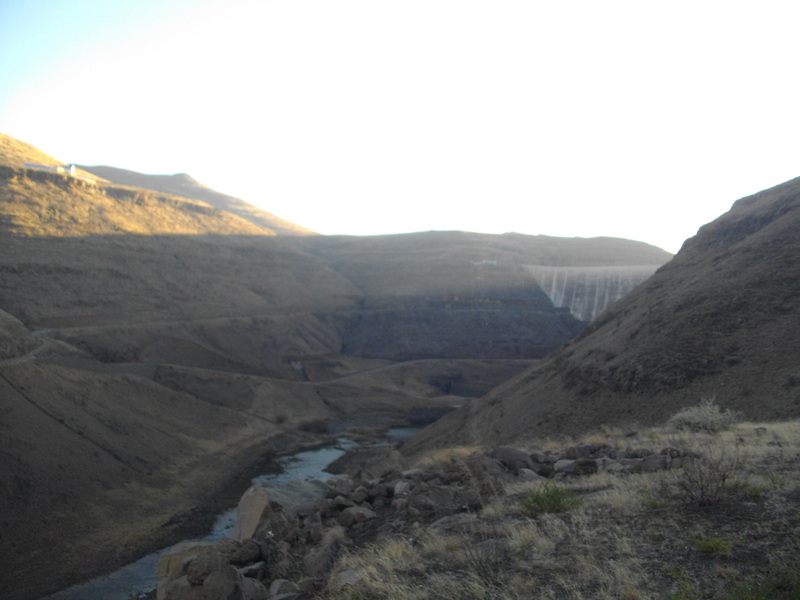 Lesotho has always been a poor country, with low levels of education and high levels of unemployment, and recently with the recession many Basotho have lost their jobs in South Africa and have returned home in a desperate state. Proximity to South Africa cannot help much, with the lingering feelings of Apartheid, compounded by the status of second highest murder rate in the world, not to mention the HIV/AIDS crisis. 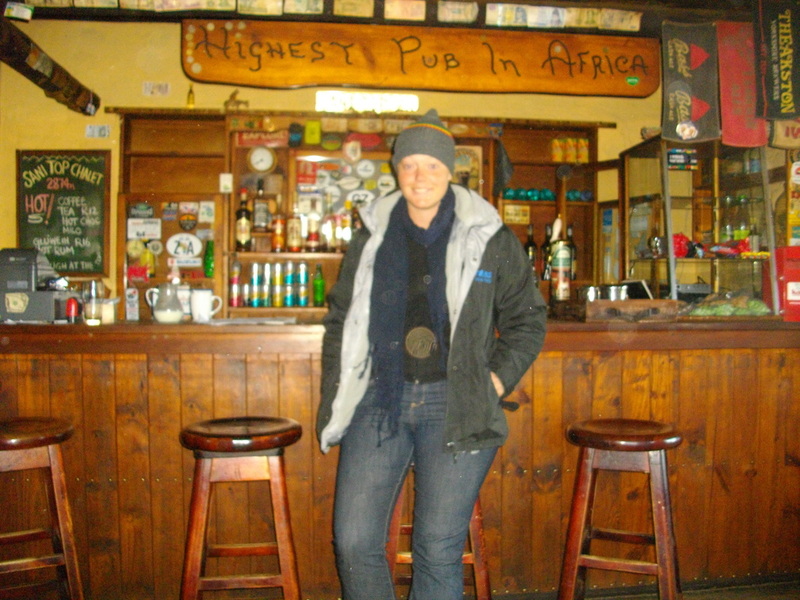 Despite all the negativities, I must add that in my experience, as is usual in Africa, the locals were incredibly nice and hospitable, always offering reliable advice, safe hitchhiking, and happy memories. Of course, horror stories make better conversation. On top of the Lesotho plateau, driving over mountain tops. 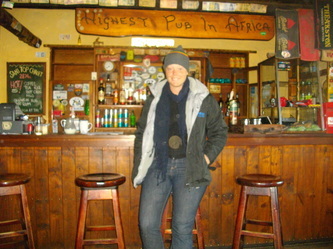 Waking up in the laundry room of the Sani Pass Pub, I was eager to head off again, hoping for better luck hitchhiking early in the day. After a short lift with the owners of some sheep who were going to check on their flock and herder-boy, it was off again hiking up the snowy mountains. 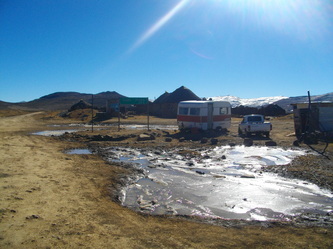 Now I was beginning to see signs of the mountain-people. They live in villages and practice agriculture, but boys and young men will head off for weeks at a time to find grazing land for their animals. 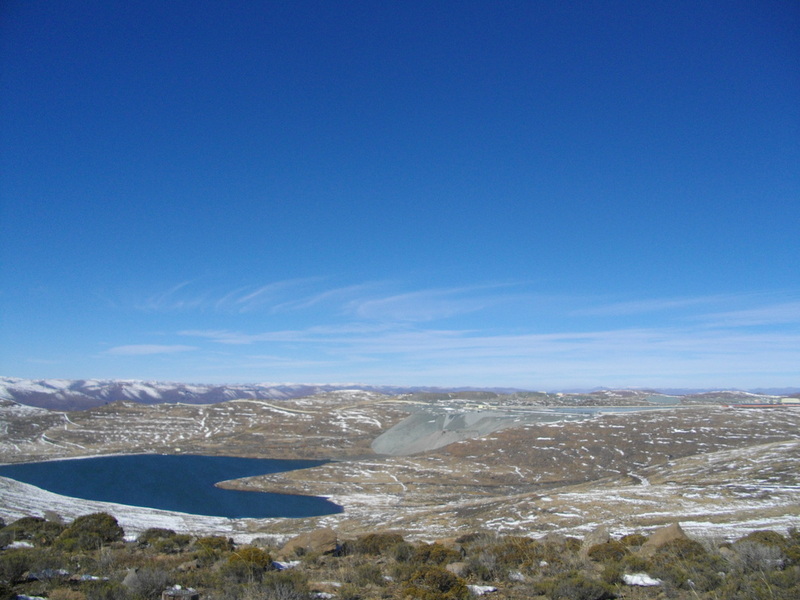 Staring out at distant mountains, one can pick out the low rock wall enclosures where the merino sheep, mohair goats and cattle are herded nightly. These pens are always accompanied by a small rock rondavel hut for the herder; but how they keep warm with nothing more than blankets to protect them against the cold winter air, I do not know. 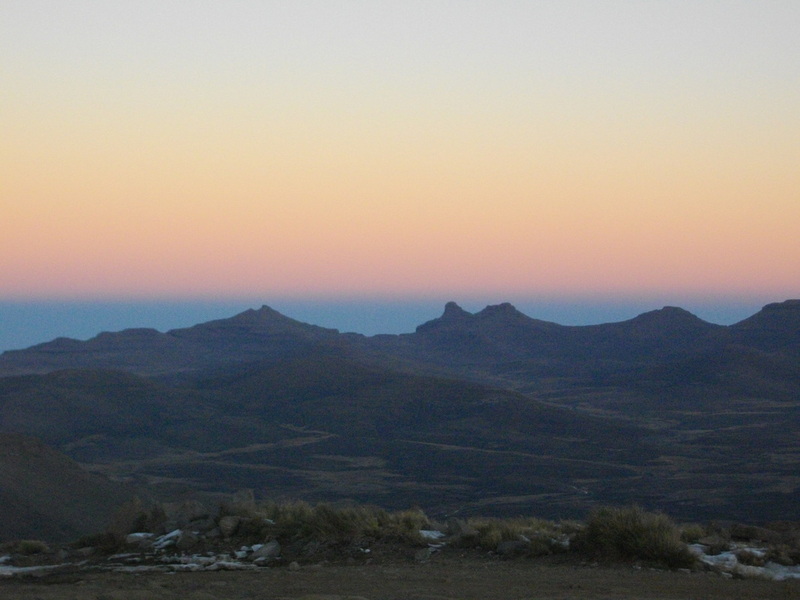 The first working herder I spotted was standing on rocks high atop a mountain, wrapped in the traditional Basotho blanket, staring down at me with two shaggy dogs at his side. I waved and so did he. 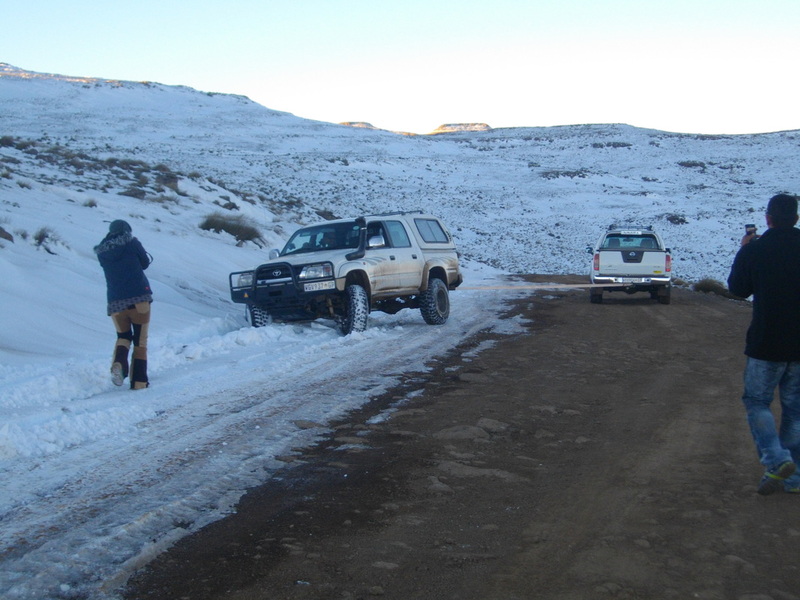 Later, in a warm BMW 4x4 with a South African family touring Lesotho – it was their first time seeing snow – we spotted many more of these figures camouflaged among the rocks and shrubs, always with white, wooly, snowball-like livestock dotting the mountainside nearby. Speeding along the rocky, winding tracks with the South Africans and their three car convoy, we passed many small villages, neat rows of maize fields reaching surprisingly high altitudes, countless villagers wrapped in their wool blankets and often mounted on shaggy horses, and of course, a few diamond mines. 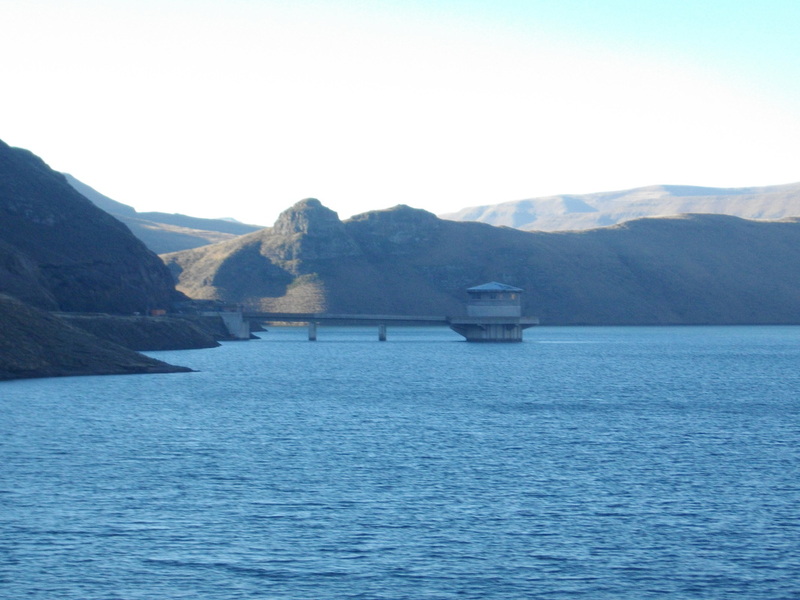 We drove over the “highest road in southern Africa” at 3222 m, and nearing twilight arrived at Katse Dam – Africa’s highest in altitude, second largest in size – a massive 185m wall that has created a huge picturesque lake winding through the mountains. The clean, delicious spring water is sent direct to South Africa via a tunnel in the lake, to help with Johannesburg’s ever-increasing water shortages; although, T.I.A., and the villagers rarely see the benefits of the profits. Arriving at Katse, a little asking around had me lodged in a tiny hut belonging to Mike, the local Peace Corps volunteer. 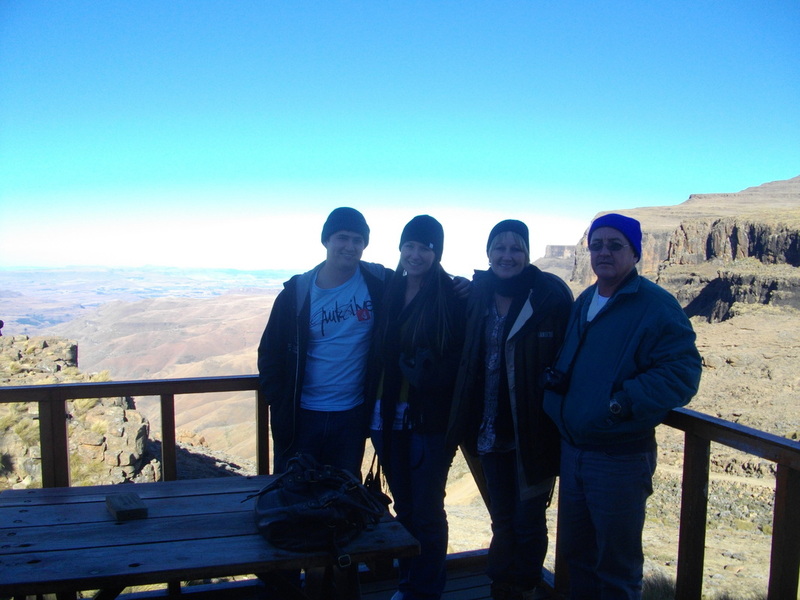 Along with his amusingly sarcastic German volunteer friend Alex, we chatted about life in Lesotho and some of the issues faced by the country. The next day I was off again, hitching mostly in trucks, and heading for the capital, where I arrived just in time to be a guest of my Couchsurfing host Anita’s delicious Indian dinner party. Coconut prawn curry is always something to write home about when you are fresh out of the bush. 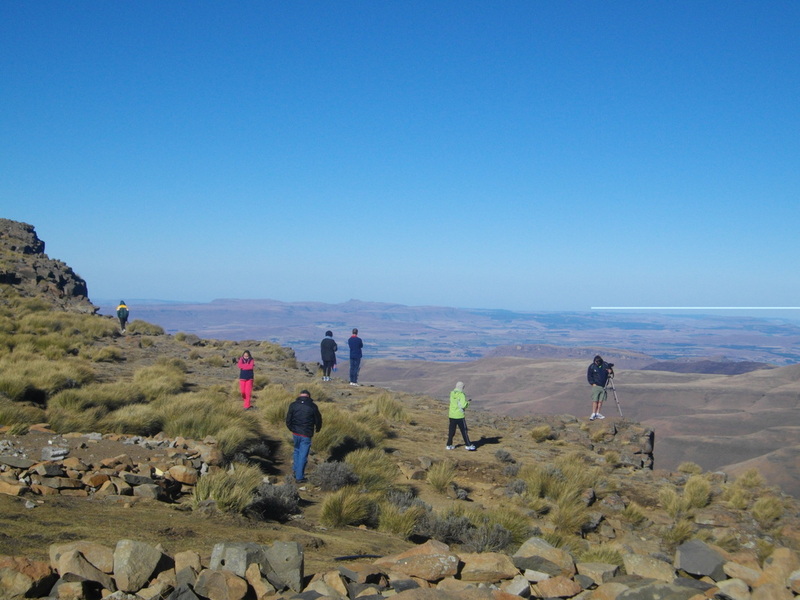 Lesotho is a refreshingly distinct experience for the modern wanderer of Africa, and along with the animals, the Indian Ocean, and dancing to village djembe, it should be high on the to-do list of anyone who comes to the south. 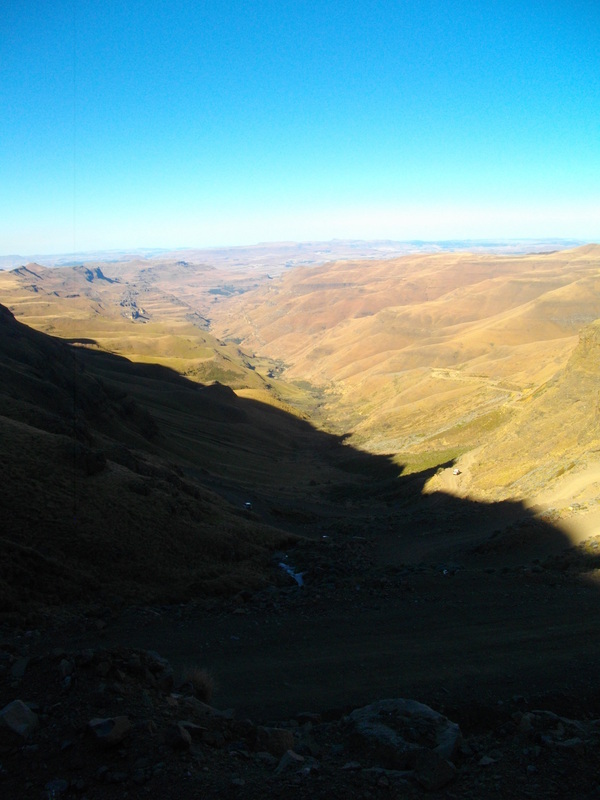 As for me, I waved goodbye to the snowy, Basotho mountains, safely and quickly hitchhiking back to Pietermaritzburg, South Africa, where my bike sits awaiting action. Together with my CS friend Andrew and his groupies Tim and Margie, we have spent the weekend in sophistication playing Kings whilst braaing the finest boerewors and sipping the finest beverages. Time to hit the road again soon though – almost July already!